What are its features? Does it have a good build? What’s it like when using it? What do we like the most about it? Is there something we don’t like? What’s our final take on the mirror? Creating a nice makeup takes practice and it’s not only the cosmetic products that help you get there. 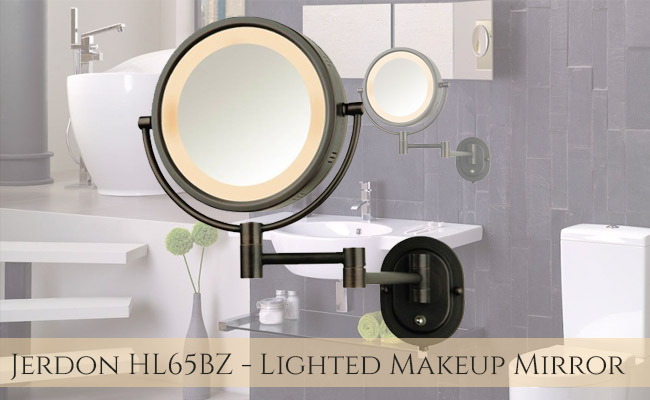 You also need a good, lighted vanity mirror that isn’t just clear, but also comes with magnification so that you can work as much as you want on those little flaws that you need to hide with your makeup. The market gives you plenty of options but when you’re looking for a specific model, like a wall-mount mirror, you also need to pay attention to other features as well. 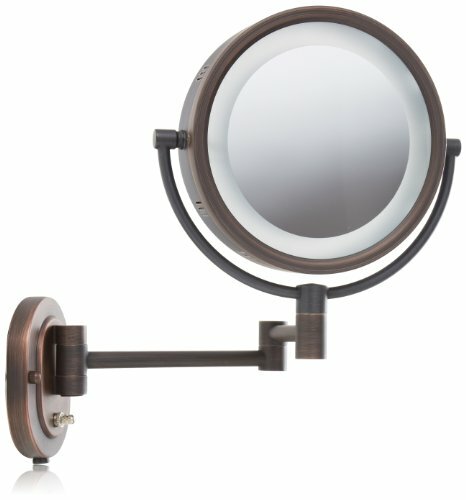 Why try the Jerdon HL65BZ 8in Lighted Wall Mount Mirror? A wall-mount lighted vanity mirror is going to be seen in any room, so how it looks in your décor is pretty important. Luckily for us, the Jerdon HL65BZ Wall Mounted Mirror makes a really nice first impression and its elegant and sleek profile that catches your eye. The lighted vanity mirror is far more than a pretty face, and manages to check most quality boxes too. It gives good and bright light, it’s easy to use and fairly easy to install too. Its mirror is clear and it comes with an accurate magnification too. This is just a general description of the mirror though and scrolling down for a detailed look is going to help you get a better understanding of its overall quality. The mirror does get your attention with its modern and sleek profile and it looks nice in any room. It comes with 5x magnification side so that you can work better on your detailed makeup or to finally get the perfect look for your eye brows. The magnification is precise and it’s quite enough for getting all the small details that you want to check. The two-sided mirror is fog-free so the image is nice and clear, distortion-free. It has an 8-in diameter frame and it comes with a 360-degree swivel design. You can get all the angles you need for a flawless makeup. The mirror swivels nice and smooth and you don’t need to struggle for getting the right point of view while working on the tiniest details. The mirror comes with an on/off rotary switch on the oval base that allows you to turn on/off the halo lighting around the perimeter of the mirror. The light is soft and enhancing and glare-free. The list of good features continues with the 14-in extension arm that rotates smooth and easy for all the angles you need for the flawless makeup. The mounting bracket is 4in. x 5in. and it’s easy to move around. However, it stays in place and has a stability feel, even for the weirdest angles. The mirror comes with the mounting hardware and you only need to bring on your handyman game. The mirror is corded and the 6ft. cord is curled for easier use. When it comes to the build, we notice the bronze finish that keeps moisture and condensation away from the mirror. Not only this finish looks nice, but it also has protective properties. The mirror is well made and has a durability feel to it. As long as you’re wall-mounting it right, you shouldn’t worry much about its lifespan. We also need to mention that this model is a popular choice for many luxury hotels and spas. The mirror is easy to install as the instruction are pretty clear and user-friendly. The mirror comes with the mounting hardware you need for the installation. The extension arm that swivels runs nice and smooth and getting that weird angle that you want for working on the eye brows isn’t difficult to get. The curled cord saves you from the trouble of always having it tangled with other cords. It’s a clear cord that is subtle for any décor. With no adjustability for brightness, the mirror is easy to operate and the on/off switch for light makes use no brainer. Sleek and elegantly looking, the wall-mount lighted mirror gives you the chance to work on the tiniest details for a perfect makeup or grooming session. Its installation is easy and its image is clear and accurate so there are no obvious reasons for you to turn it down next time you’re shopping.